With my mom and sister in-law out of town, Andrew and I thought it would be nice to have my step-dad and brother over for a guy’s night, plus me. When considering recipe options I took into account that my step-dad, Jim, is a meaty pizza kind of guy. My sister in-law is a vegetarian so when my brother, Joe, took us up on our offer for dinner he eagerly asked, “Can you put meat on the pizza because Aimée isn’t here?” I decided to create a Philly Cheese Steak pizza. 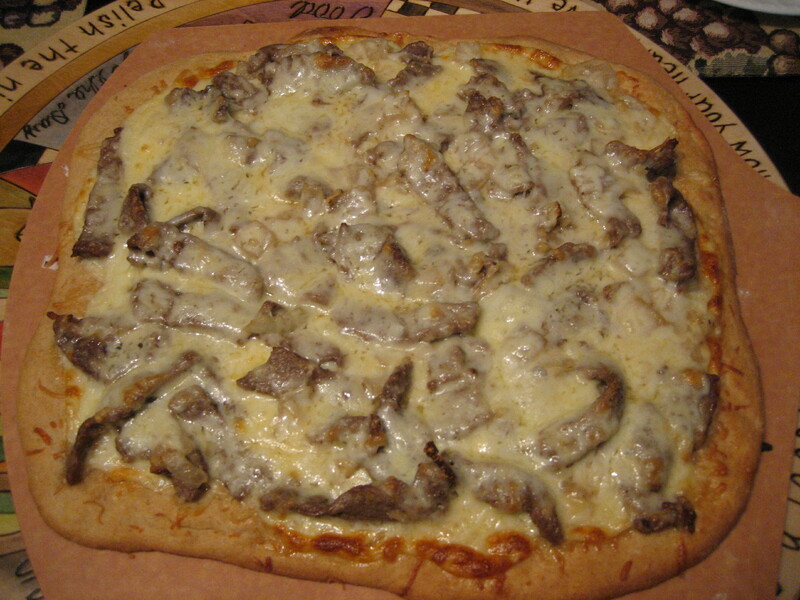 The idea for Philly Cheese Steak pizza came while we were watching the Philadelphia episode of Man v. Food. Adam took down a massive cheese steak at Tony Luke’s in Philadelphia. Despite never having a cheese steak sandwich before, I was drooling at the idea of creating a pizza out of this sandwich. Andrew picked up the ingredients at Wegmans where the guys at the meat counter graciously sliced and pounded a pound of rib eye. Being a fantastic sous chef he even sautéed the thinly sliced steak along with onions and garlic when he got home. I spread provolone cheese on the dough, tossed on the steak and onion mixture, and topped it with fresh asiago, parmesan and mozzarella cheeses. The Philly Cheese Steak pizza was definitely a winner and I now see why it is such a popular sandwich. My mom and sister in-law can rest assured that I sent Jim and Joe home with full, satisfied bellies. And if you’re reading this Adam Richman, I will gladly have you over for a Philly Cheese Steak pizza challenge anytime.